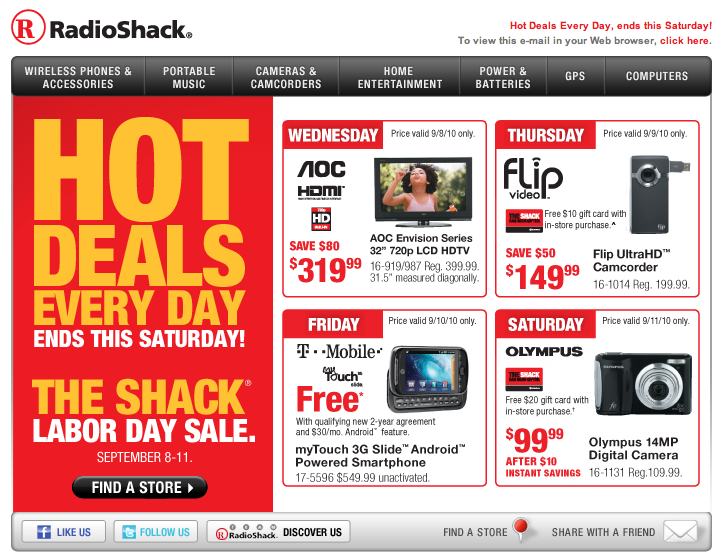 You are here: Home > myTouch Slide Free At Radio Shack Today Only! myTouch Slide Free At Radio Shack Today Only! We’ve never been ones to pass up a great deal so for those of you who have been eyeing that myTouch Slide for a while now, Radio Shack has a deal for you. Of course the wording is a little vague “with qualifying new 2-year agreement” so it’s possible this could swing for both upgrades and new customers but surely one of our readers can clarify for us or else we’ll be calling up Radio Shack when they open for our own clarification. If the T-Mobile G2 just doesn’t interest you but a Qwerty keyboard does, the myTouch Slide is more than capable of holding its own on the Android front and at a zero dollar price can anyone really complain? This deal is good for today September 10th early so don’t wait to long! Who would want this when it’s about to get mushroom slapped by the g2? Went to Radio Shack’s web site – free for new account; $79 for upgrade. Still a pretty good deal! I think I’m going to return the cliqxt and get this one for my daughter. you should have never bought the cliq in the first place. a word of advice to people dont buy a motorola ever. unless your on verizon. its a nice phone over all. But I don’t like the UI. Nice deal though. Yeah on their site it’s been free for about a week or so, maybe a bit longer! It’s just something to get customers in to Radio Shack, I know I used to work at the Shack for 2 years. Radio Shack might as well be a phone store only because every single customer that comes in for what ever reason, has to be ask about their phone service and we were told to try to sell them a phone. So you walk into a Shack and you’ll get asked about how’s your phone service? That being said, anything that can help out Tmo’s sales is a good thing I guess, after all we’re in Q4 and Tmo (like all other carriers) is looking at the bottom line and want to be in the black coming 2011. Well if Tmo wanted, I’m sure they could be doing a lot better. But I just read that all the Moto phones are pretty much “end of life” so what’s that leave? The Behold II, Cliq, Cliq XT, My Touch, My Touch 2.1,and Garmen Phones all end of life..all on Tmo..the company that brought Android to the world. Wow. That’s almost our entire stable of Android phones. I hope they get it together and start keeping their promises and updating their phones otherwise we may end up with a Tmo to call our home. It’s a disgrace that any of those phones are still for sale. T-Mobile desperately needs to clean up its lineup. Actually, the MyTouch is old but not quite disgraceful yet. The rest, though, wow.